It looks like things are moving right along with the R-rated Spawn reboot. Todd McFarlane closed a deal over the summer with Blumhouse Productions to direct the movie, making it his directorial debut. 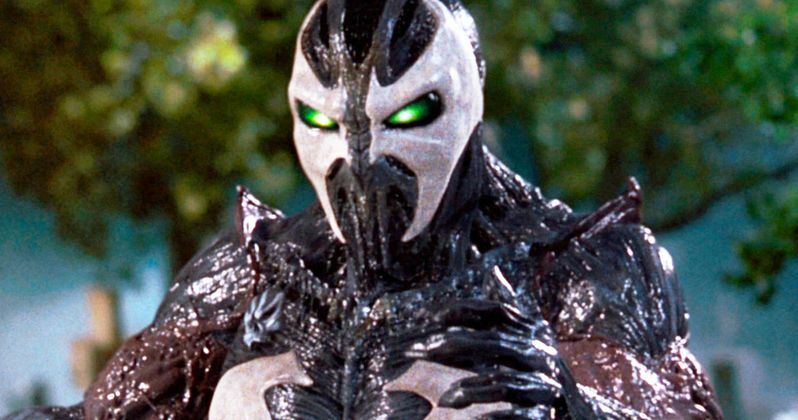 Now, thanks to a panel at New York Comic Con, McFarlane reveals that pre-production is slated to start just after Christmas, with cameras set to roll on the low-budget Spawn in February of 2018. That means, if all goes well, we could see the movie arrive in theaters in early 2019. Deadline reports that Todd McFarlane, who created the Spawn comic in the 90s, is also promising to provide is Facebook followers with daily updates from the set. This is something that most major productions wouldn't allow, but since the movie is being independently financed, director Todd McFarlane will have a lot of freedom. Not to mention that he wrote the script, is on as a producer and director. This movie is his baby and he's doing it his way. Blumhouse has a first look deal with Universal Pictures, but it isn't out of the realm of possibility that the movie winds up somewhere else. Here's what McFarlane had to say about it and his sole creative control. "The only things we need from them. are distribution and marketing. We don't need your input, we don't need your cash, we don't need your creativity, and they don't like those deals. They always want the budget to go up because then they have to put money in it and then they own it." Todd McFarlane did note that Universal Pictures is likely to "take it," meaning that they'll probably sign up to distribute Spawn, but it's clearly only going to happen under his strict set of conditions. He also reiterated that the movie will be "dark and R-rated." While comparisons will be made, he said it won't be like Deadpool "with a couple F-bombs and a couple bare asses." He said, "I will have a shark in black water and if you're swimming he will come and you'll be gone and he will f*ck you up." As for where he gets his confidence to be able to direct such an ambitious movie even though he's never directed a movie before? Here's what he had to say in response to a fan question. "I didn't use to draw comic books and I drew comic books and I won awards. I don't know how to read music and I have a Grammy Award...I'm spending my own money so who cares if it doesn't work out. It's a $10 million budget movie, and (a studio) would just get a 22-year-old punk director. I just want to be the old punk directing it." Spawn isn't at all going to be your average comic book movie in a lot of ways. Not only in what is being presented to audiences, but what is going on behind-the-scenes to get it made. If this works out, we could see something of a shakeup going on. For now, we can look forward to production kicking off early next year and a whole lot of updates from Todd McFarlane. We'll be sure to keep you up to date as more information on the Spawn reboot is made available. This new report from Deadline could be just the first update we get on this project as New York Comic Con kicks off.